FFWPU USA: Shine City Project was started on March 16, 2013 by the Las Vegas Family Church. True Father inspired the idea for Shine City Project. He wanted to turn Las Vegas from being Sin City to Shine City. The group organizes city cleanups, the first of which was held at the Bonanza Gift Shop which is popularly known as the World’s Largest Gift Shop and is located just north of the Las Vegas strip near Las Vegas Boulevard and Sahara. With Shine City Project efforts, the area has been kept fairly clean and has inspired others to take greater responsibility of the communities that they live in. In April 2013, Shine City Project began to expand to members outside of the Las Vegas Family Church. By going to the University of Las Vegas (UNLV) campus and handing out flyers, the organization began to attract a number of UNLV students. Continuing into the summer months of 2013, the organization ambitiously held cleanups every Friday and Saturday morning despite the hot weather. 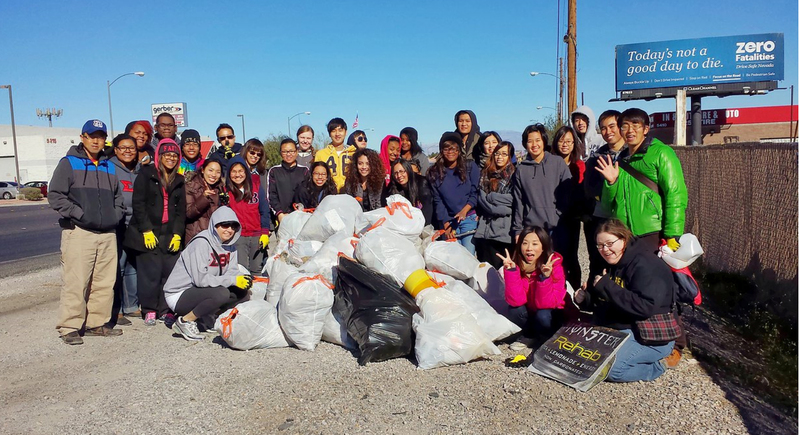 The organization grew, and eventually, with the help of several students and the UNLV Solid Waste and Recycling Manager and Sustainability Coordinator, Tara Pike-Nordstrom, as faculty advisor of the group, Shine City Project was established as a UNLV student organization on October 8, 2013. During the UNLV fall semester, the organization began to do more than just picking up garbage off of the streets and parks of Las Vegas. With the help of Tara, the organization began to help with the recycling and composting efforts at Sam Boyd Stadium through the national Game Day Recycling Challenge. This event involves universities across the United States to compete by diverting as much waste from landfills and incinerators. With Shine City Project’s efforts, UNLV was able to rank at the top in several categories for this competition.